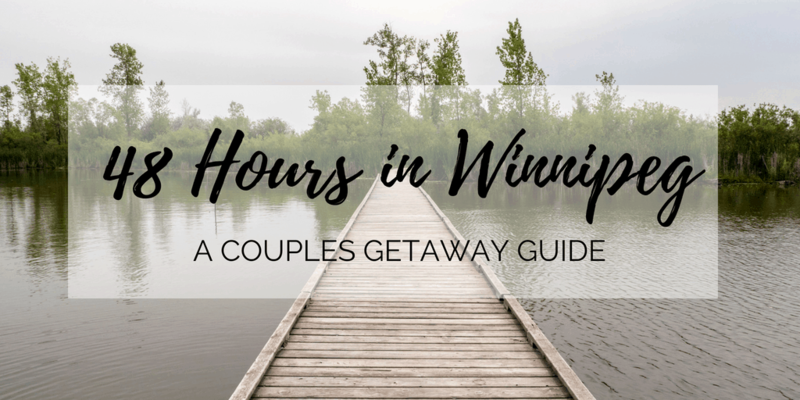 Winnipeg is the perfect weekend getaway for couples! If you’re looking to spend the weekend away with your other half, look no further than Winnipeg, Manitoba. It’s an unconventional city break: maybe you’re usually jetting off to bigger cities like New York, Los Angeles, or Vancouver. 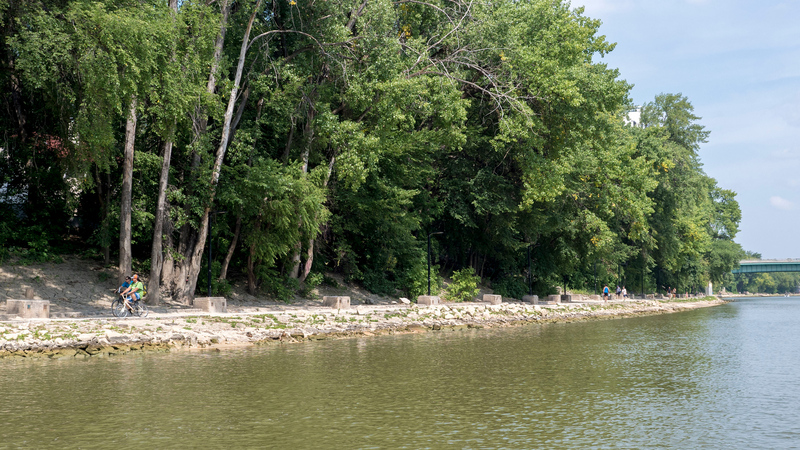 There’s a lot to be discovered in Winnipeg, from natural prairie landscapes to scenic river walks. 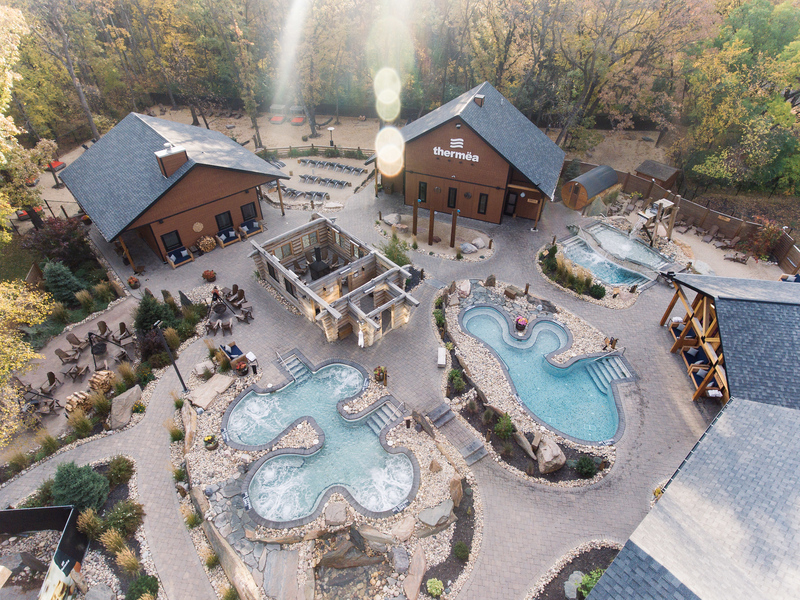 And what’s a weekend trip without a visit to a therapeutic spa? There are so many unique and special things to do in Winnipeg, whether you’re travelling as a couple or going on a getaway with your besties. 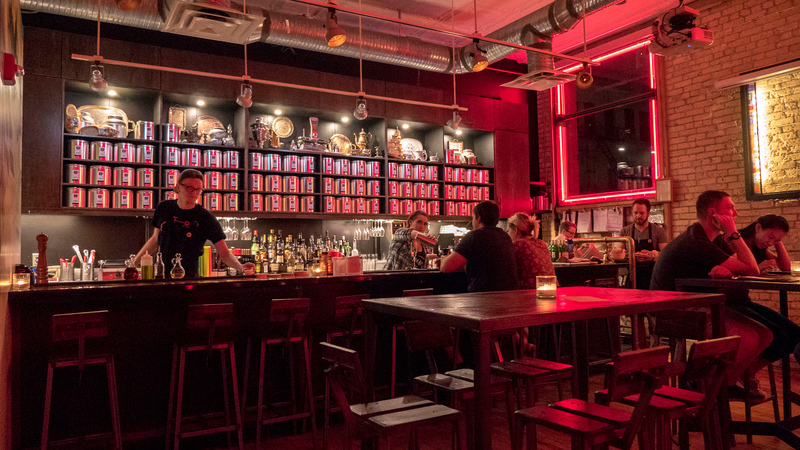 Here’s our guide to the best 48 hours in Winnipeg. 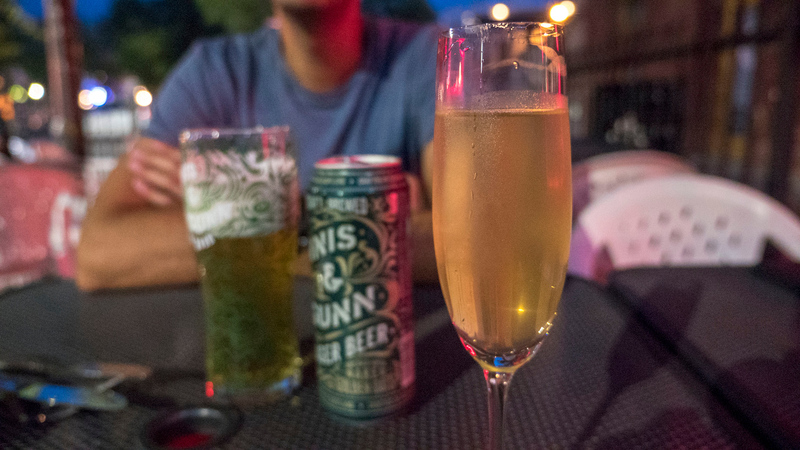 One of the best ways to experience a new place is to frequent the favourite local hangouts. As Winnipeg isn’t a super touristy destination, you won’t find massive crowds or lineups. On our first day in the city, we visited Winnipeg attractions that are beloved by those living there. These points of interest included FortWhyte Alive, walking around town seeking street art, and attending a summer festival. 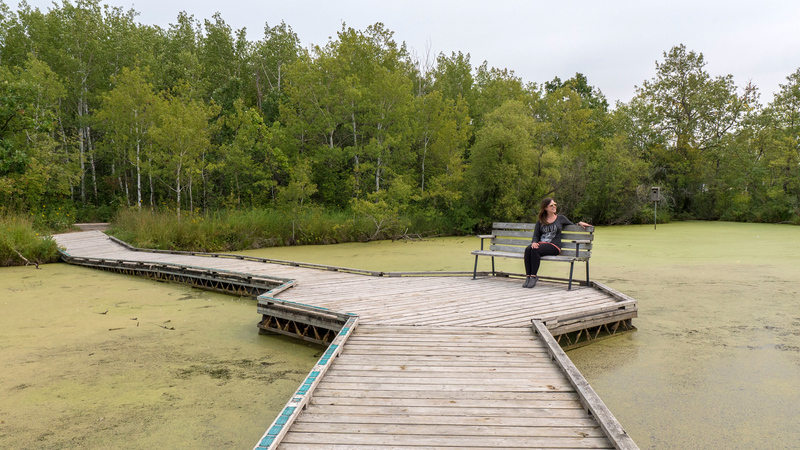 FortWhyte Alive is an urban natural environment where visitors can immerse themselves in the wilderness without leaving the city. For anyone looking to get some exercise, breathe in fresh air, and enjoy an escape from the everyday, FortWhyte Alive is the place to be. However, this site wasn’t always a natural oasis. Back in the early 1900s, the Canada Cement Company used the area to mine clay and gravel. In the 1950s, the site became obsolete from flooding and clay being sourced elsewhere. 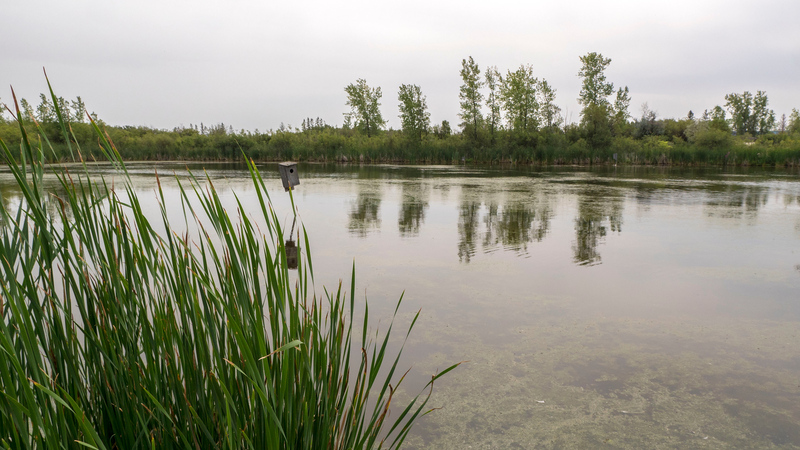 Thankfully, the Wildlife Foundation of Manitoba reclaimed this former industrial site and slowly transformed it back into a natural habitat for native flora and fauna. 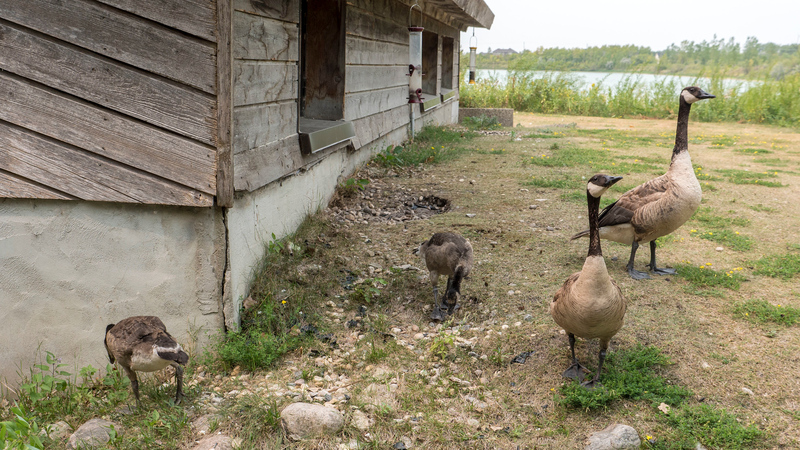 From wildlife conservation to environmental education, FortWhyte Alive’s goal is to support nature education, outdoor recreation and continually protect this urban natural refuge. 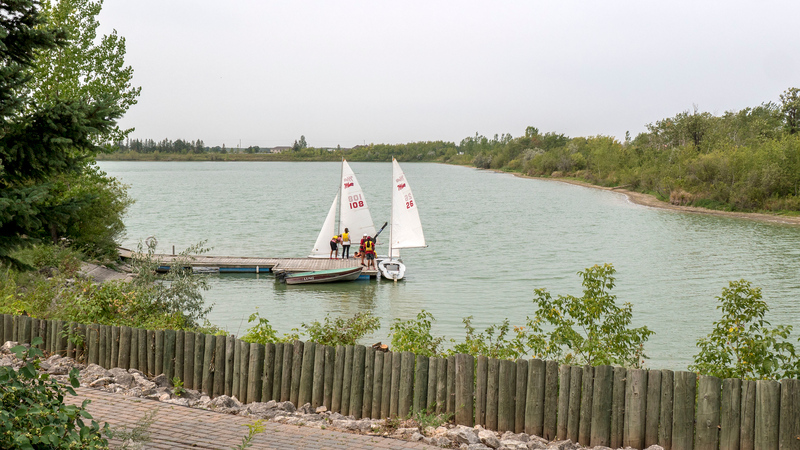 There are a range of outdoor activities and attractions at FortWhyte Alive in Winnipeg. In total, there are five man made lakes where you can rent a canoe, rowboat, or even try sailing. Walk through the forest and listen to resident and migratory birds singing their songs. Ttake note of several bird feeding stations along the way. 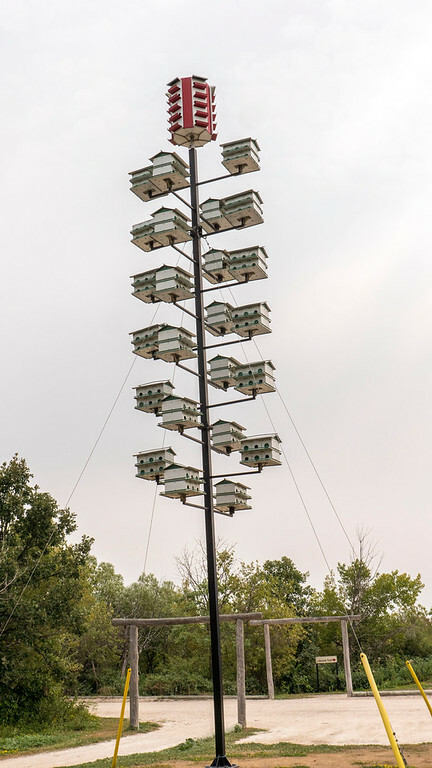 We noticed one of the largest bird housing complexes we’d ever seen, with dozens of homes stacked like a giant bird condominium. 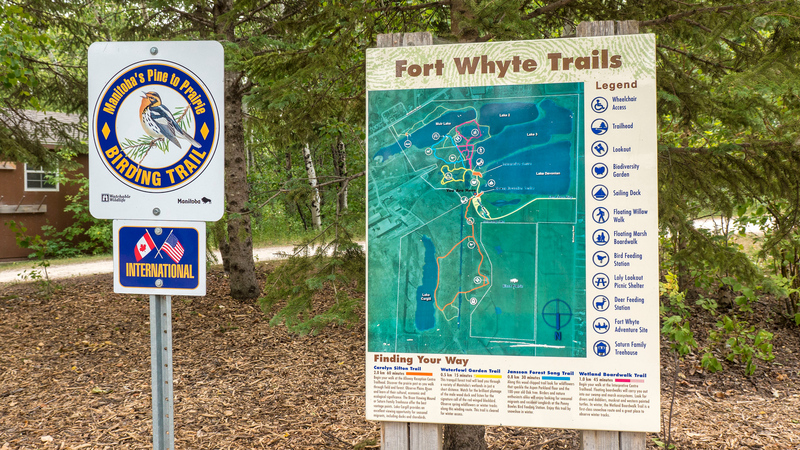 For those who love hiking, you’ll adore the 7km of forest trails at FortWhyte Alive. There are several clearly marked footpaths winding through forest habitats and prairies. The distances for each trail varies from 0.5km round trip to 4.6km in length, so there are a variety of tranquil paths to explore. Justin and I took a stroll down the Wetland Boardwalk Trail. There are floating boardwalks throughout the swamp and marsh ecosystems, which is a great opportunity to get up close to wildlife. You can see several ducks and even some dragonflies fluttering between the reeds and across the marsh. 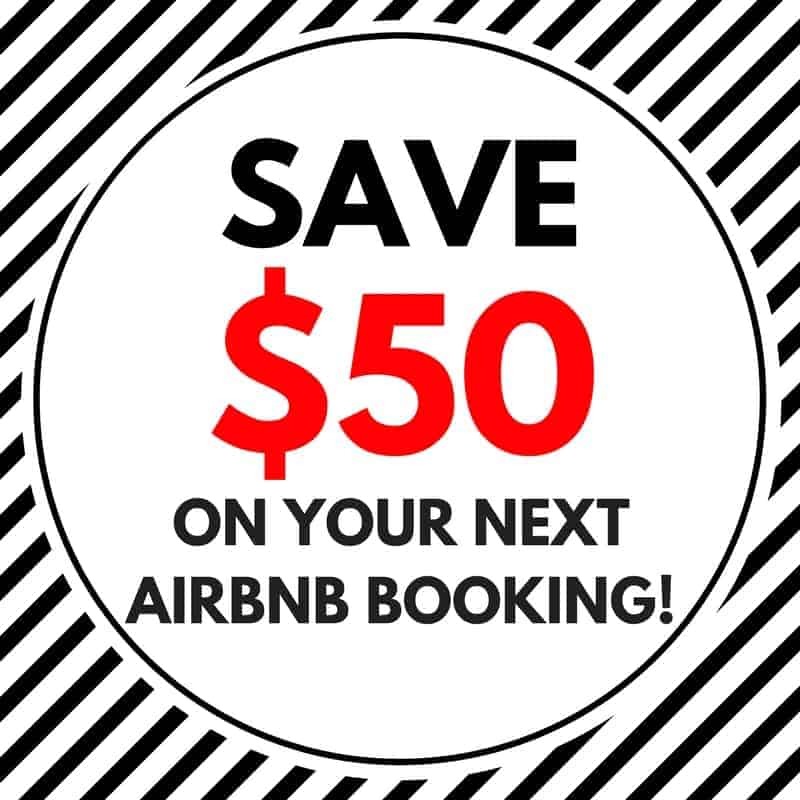 Whether you’re visiting as a family with kids, with friends, or as a couple (like us! 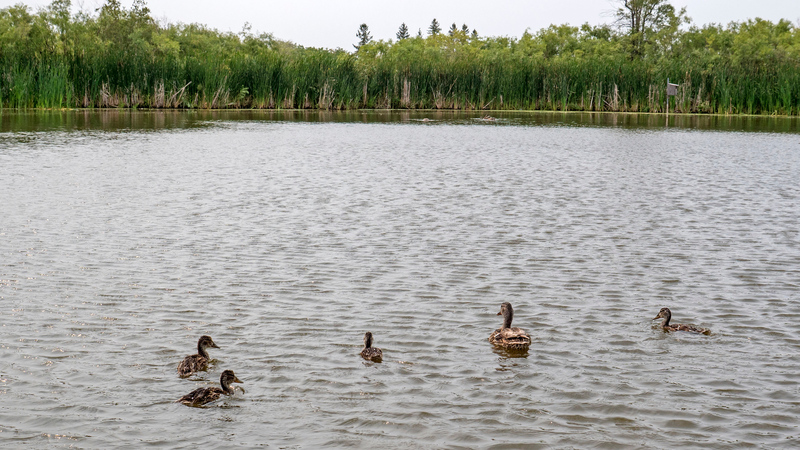 ), there’s something for every nature lover at FortWhyte Alive. Check out their events and tours page as there’s always a unique program or event happening throughout the year. There are even some vegan options at the Buffalo Stone Cafe, inside the Alloway Reception Centre. I snacked on two different kinds of hummus, pita, and raw veggies. 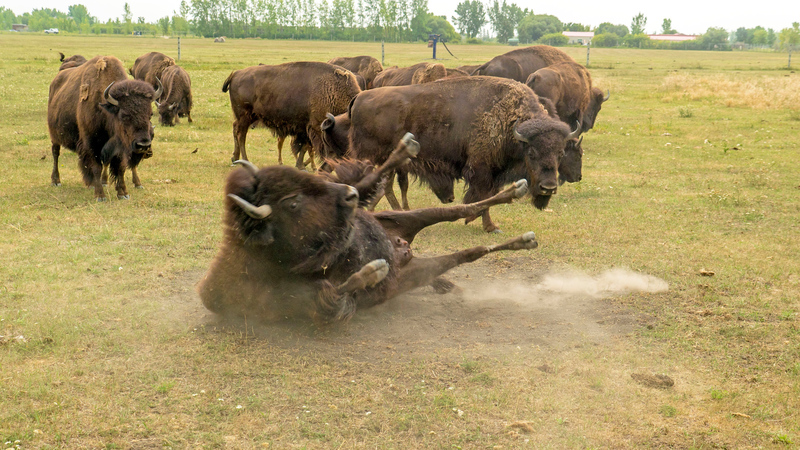 A bison safari is a unique activity at FortWhyte Alive that is not to be missed! 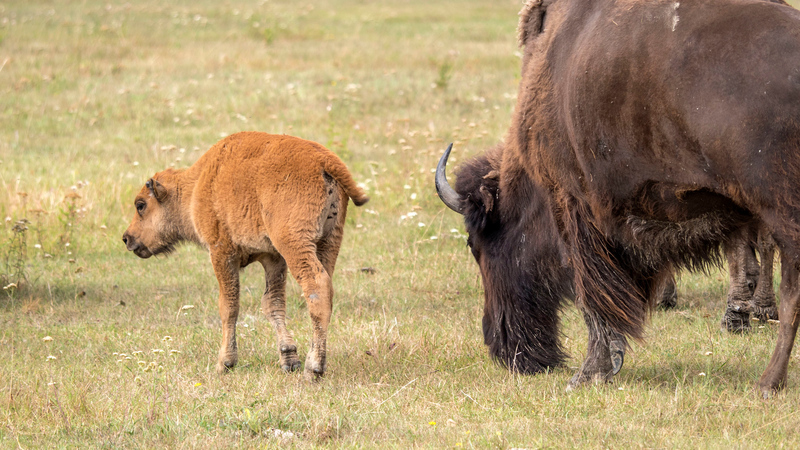 Get up close and personal with these hairy beasts in a natural Manitoba prairie setting. Justin and I were eager to see bison naturally roaming this prairie landscape. I was intrigued by the concept of a safari in Canada, having gone on safaris in Africa and Asia before. The two of us boarded a small bus, filled with mostly locals and a few tourists like us. There were families with small children, other couples, and a couple of senior citizens. Be sure to bring your camera as there are numerous opportunities for photos…and even bison selfies! With that said, you cannot leave the bus at all during the tour. On occasion, our driver and tour guide stopped the bus with the bison at a safe distance. Guests were allowed to take turns approaching the open front doors to snap some photos. Otherwise, we slowly drove alongside the bison, taking care to notice whether they were ever feeling distressed by our presence. Thankfully, they never seemed to mind that we were there, acting completely indifferent by barely acknowledging the bus. We watched as the bison wandered around the massive property, walking around as a herd. There was only one male bison in the lot, as to keep the peace. 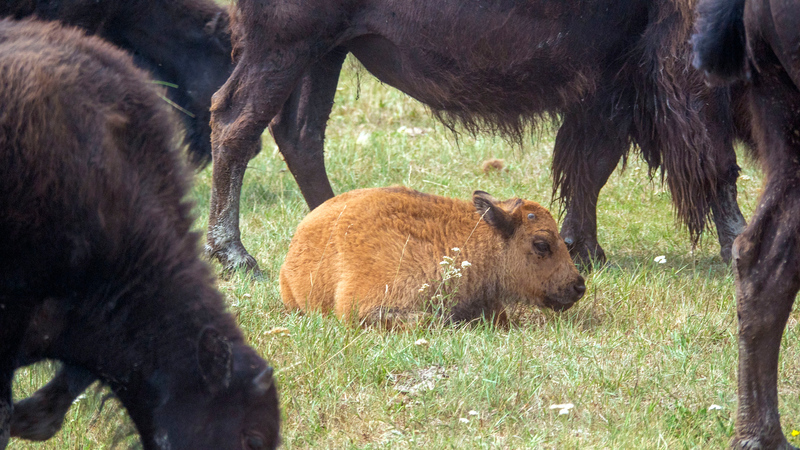 We observed several baby bison, ranging in colour from dark brown to light tan. The babies were so adorable, and the youngest was about 3 weeks old. They followed their mothers everywhere, but the herd protected them, too. I really enjoyed watching the bison take turns to roll around in a dust bath on the ground. They threw themselves to the ground and hurled their bodies back and forth in a very awkward and hilarious manner. 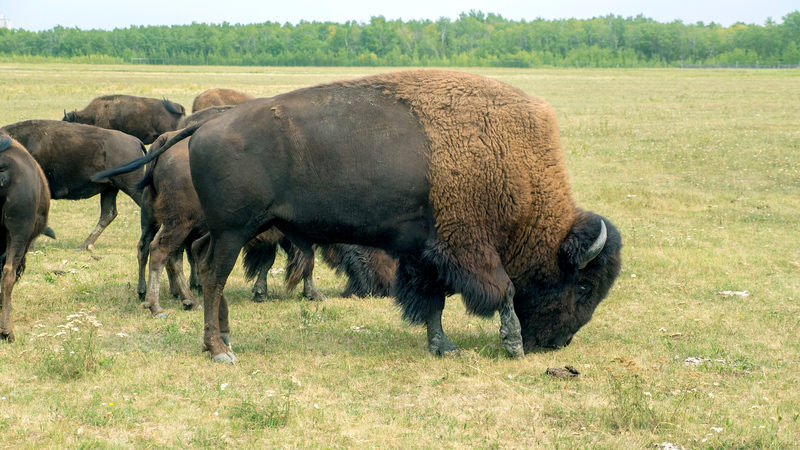 It was such a unique experience to view the bison on a safari, and a completely authentic adventure that you should take when you’re in Winnipeg. The tour lasts about one hour in length, and only runs from May to September. 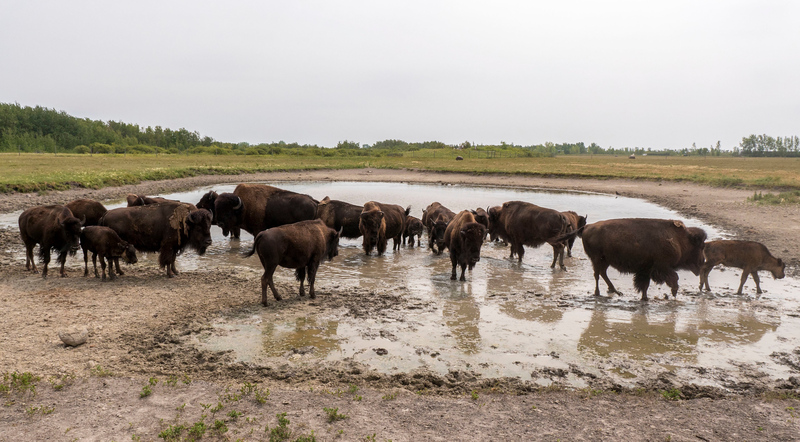 In May, June, and September, the bison safari only operates once a week, while it runs for four days a week in July and August. Tours are only once per day, and they sell out fast. Make sure you reserve your safari far in advance, especially during the summer months. 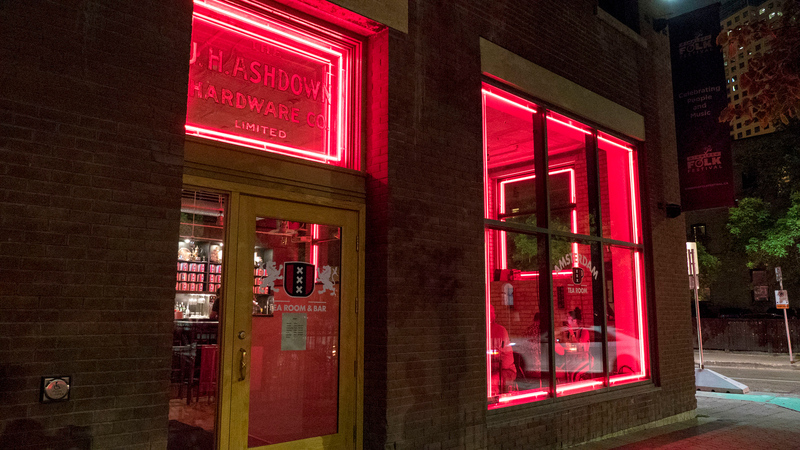 This was one of our favourite things to do in Winnipeg, so don’t miss it! Next, we ventured away from the urban wilderness and into the city itself. 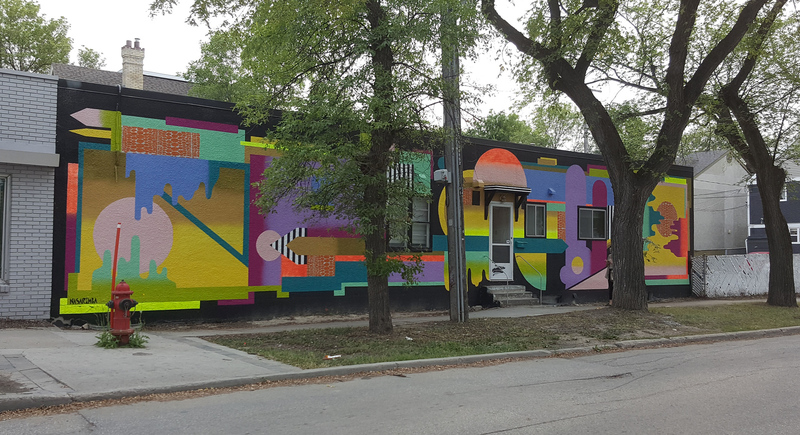 Did you know that Winnipeg is home to 600+ works of street art? These murals are all over the city and we were happy to have discovered a few of them. Justin and I randomly stumbled upon a few examples of public art in Winnipeg. 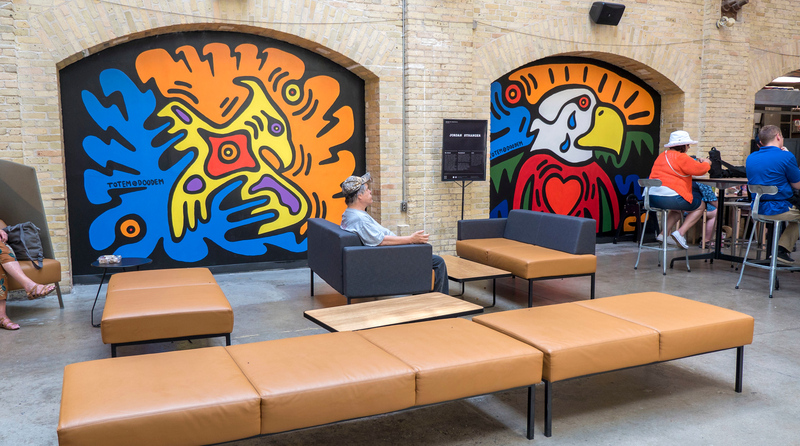 If you’re interested in planning your trip to see as many as possible, the Murals of Winnipeg website is a fantastic online resource. 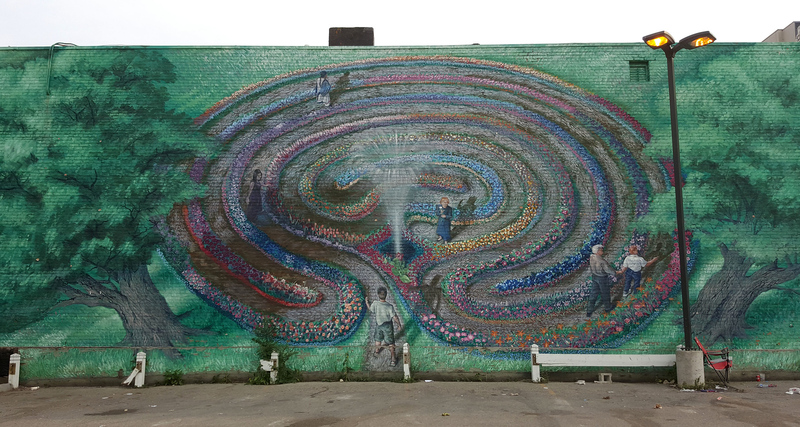 Every mural is carefully catalogued by neighbourhood, and the website is updated frequently. I highly recommend that you seek out street art as part of your list of things to do in Winnipeg. 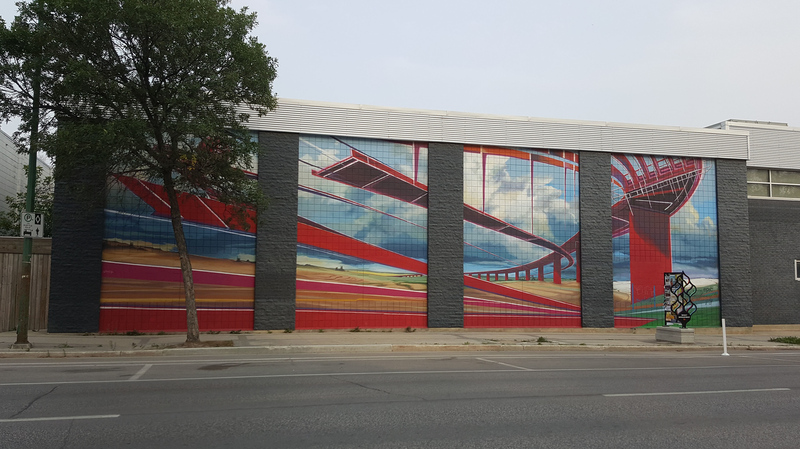 These murals help combat unsightly graffiti, tell stories of Manitoba’s heritage, and bring vibrant beauty to the city. Here are a few murals we found in the West Broadway neighbourhood. And even one of our favourite restaurants had a mural splashed along the whole side of the building! 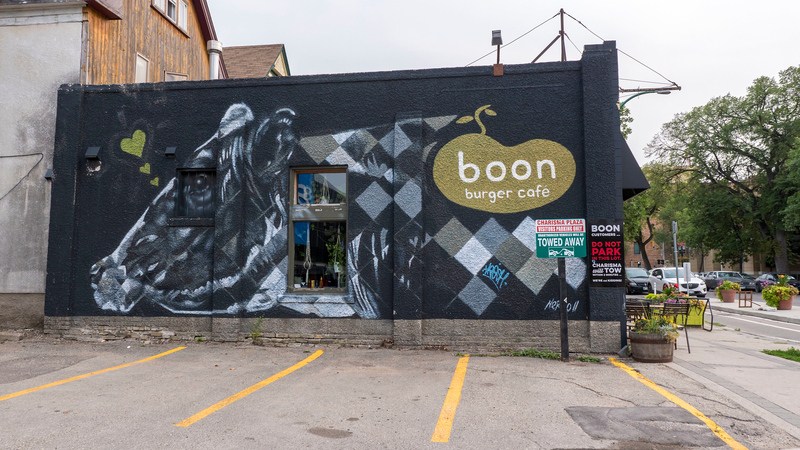 Boon Burger is Canada’s first all vegan burger restaurant, originating in Winnipeg. 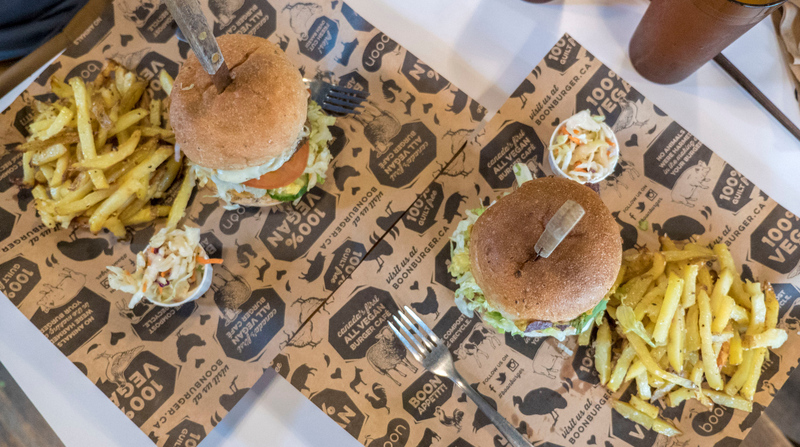 We’ve dined at several Boon Burger locations in Ontario as they’ve slowly expanded throughout cities in the province, including Barrie, Burlington, Guelph, Oakville, and Hamilton. However, we were pleased to dine at the first Boon Burger location ever! 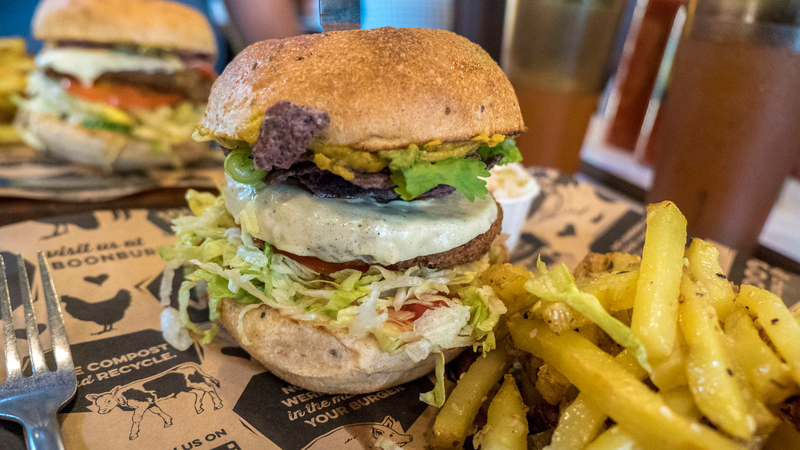 Boon Burger has a gigantic menu of veggie burgers, created from four different bean patties in a variety of combinations. Justin ordered the “Jalapeno Chedda” burger and I chose the “Mexican” burger, along with a side of fries and an iced tea. These burgers are stacked high with toppings, including vegan cheese, sauces, guacamole, and veggies. 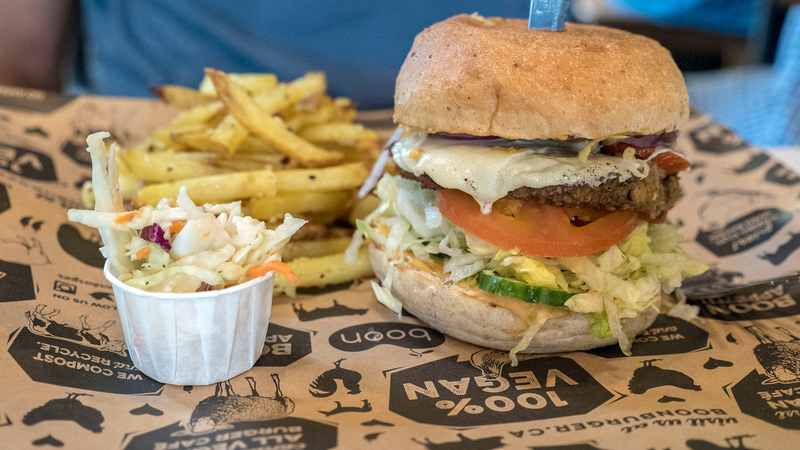 And because veganism often goes hand in hand with environmentalism, Boon Burger is committed to creating as little waste as possible. 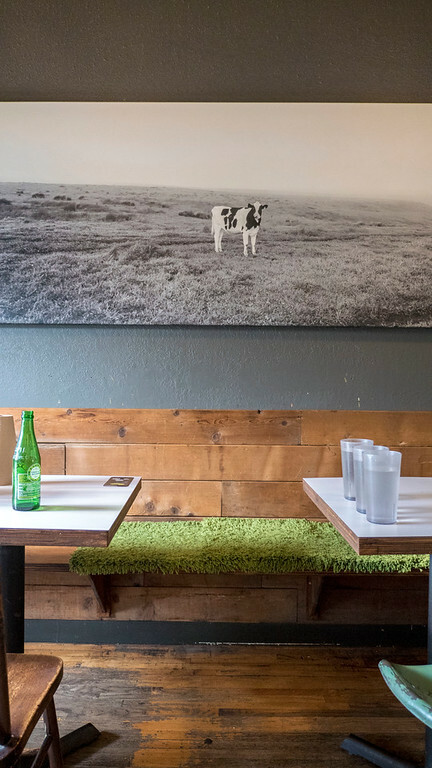 Mostly everything can be composted or recycled, and the restaurant ends up with one small bag of garbage per week…for the whole restaurant and its customers! Amazing! Looking for more vegan food? 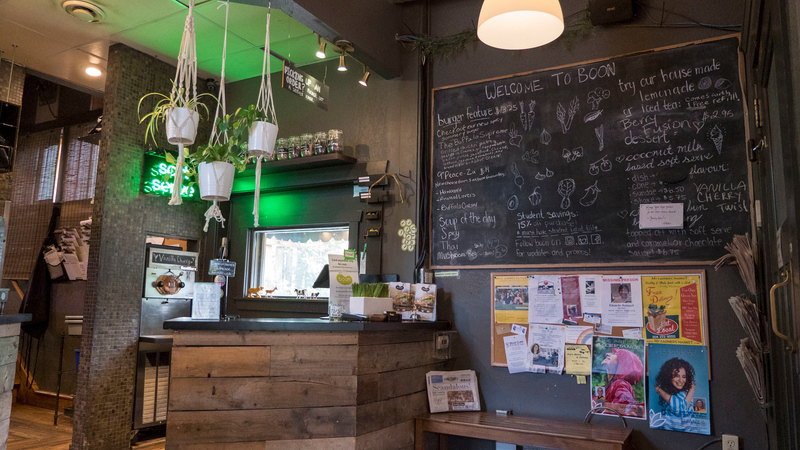 Check out our vegan restaurant and dining guide to Winnipeg! 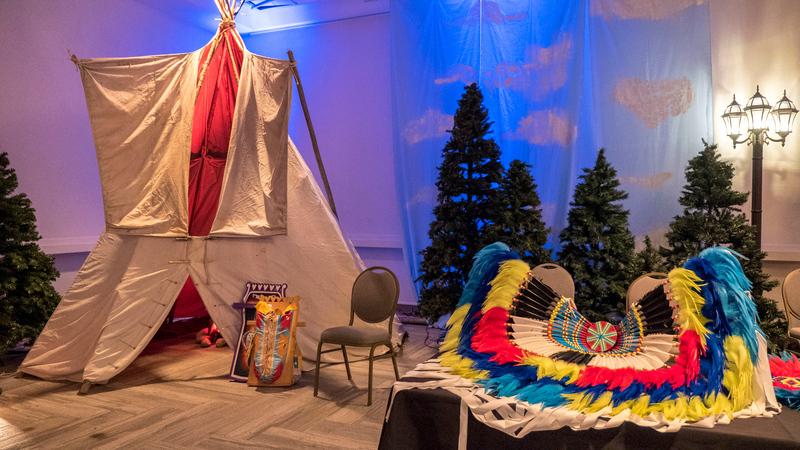 Winnipeg has lots of festivals and annual events happening all year long. Justin and I were visiting Winnipeg during Folklorama, so we were excited to see what this festival was all about. It’s the largest and longest running multicultural festival in the world, and it’s the opportunity to travel the world all in one place. The event takes place across two weeks, and there are pavilions for dozens of countries. You can experience the culture, music, dance, food, and art from a nation. Some participating countries include: Brazil, Scotland, Mexico, Poland, Korea, Ethiopia, Russia, and more. There are several performances for each pavilion happening daily. Justin and I stopped by the First Nations Pavilion to experience their rich culture first hand. 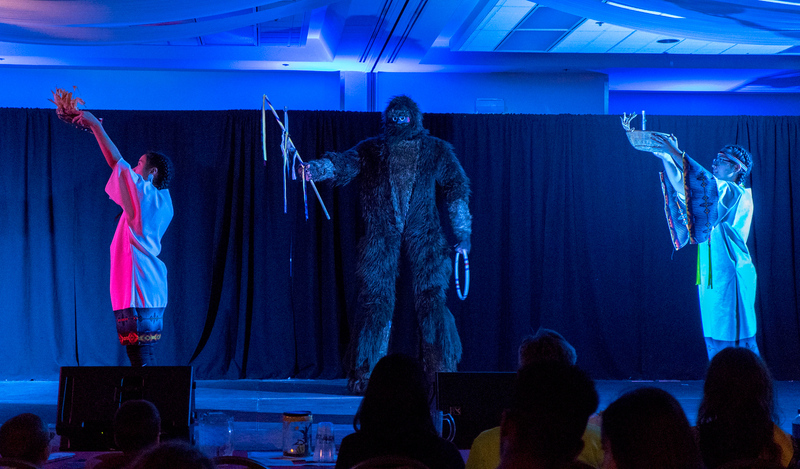 Through their performances, we celebrated the Seven Traditional Teachings, which are the core values that all First Nations people live by. In addition to theatrical performances, we saw a traditional Tipi, clothing, crafts, and more. 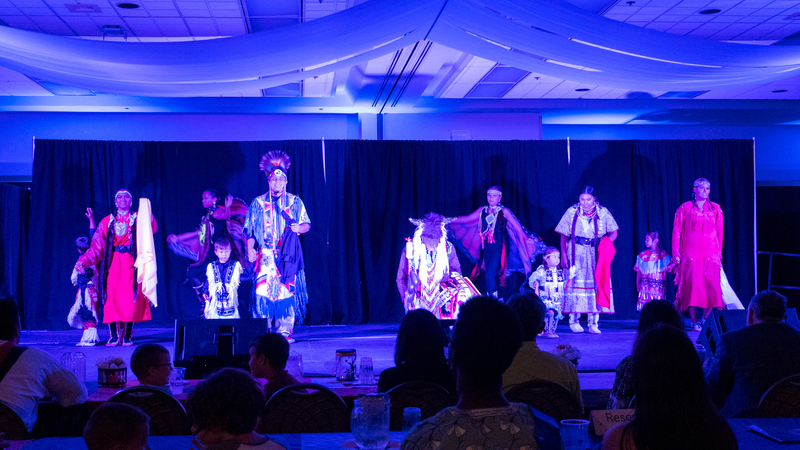 If you happen to be in town during Folklorama, it’s definitely one of the top things to do in Winnipeg. We departed Folklorama and decided that we weren’t quite ready to settle in for the night yet. Justin and I wandered over to Amsterdam Tea Room and Bar, which was a short distance from our hotel. We were drawn by the hypnotic red lights in the window, and enthralled with the concept of tea inspired cocktails. The establishment serves up a full tea menu, as well as cocktails and even food made with tea. For instance, I ordered the Jasmine Fizz, a wine cocktail infused with Jasmine tea. Justin and I split an appetizer consisting of bread and a dipper made out of olive oil and tea infused vinegar. 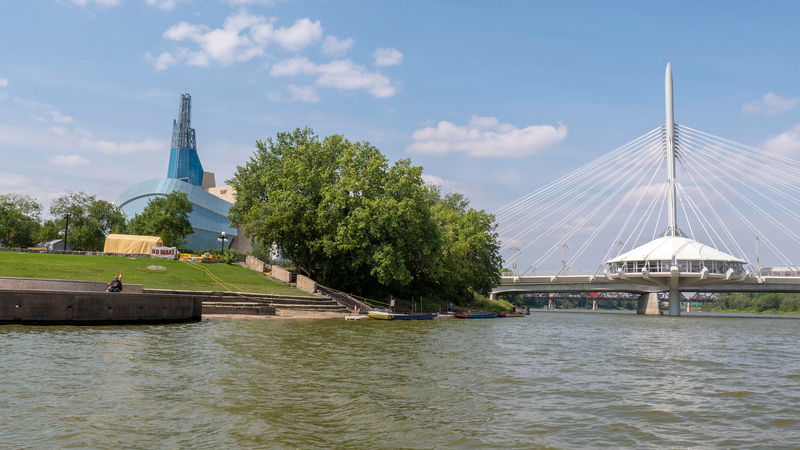 For day two of our 48 hours in Winnipeg itinerary, we had adventures by the water, on the water, and in the water! 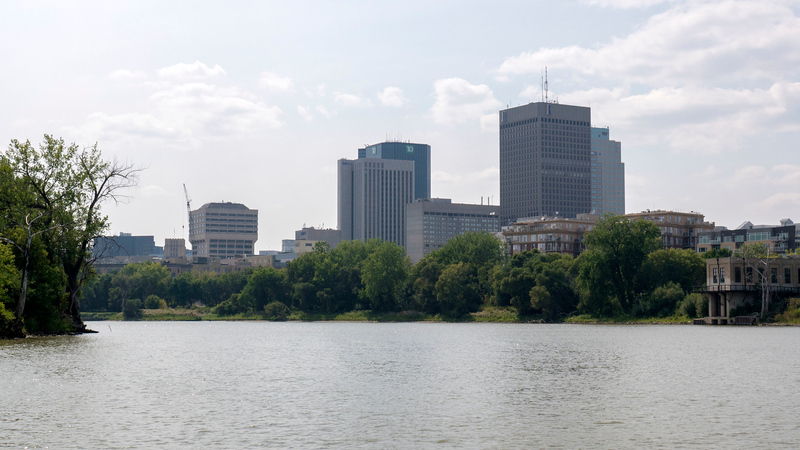 Check out how we explored Winnipeg in both exciting and relaxing ways. Here are more ideas for fun things to do in Winnipeg. 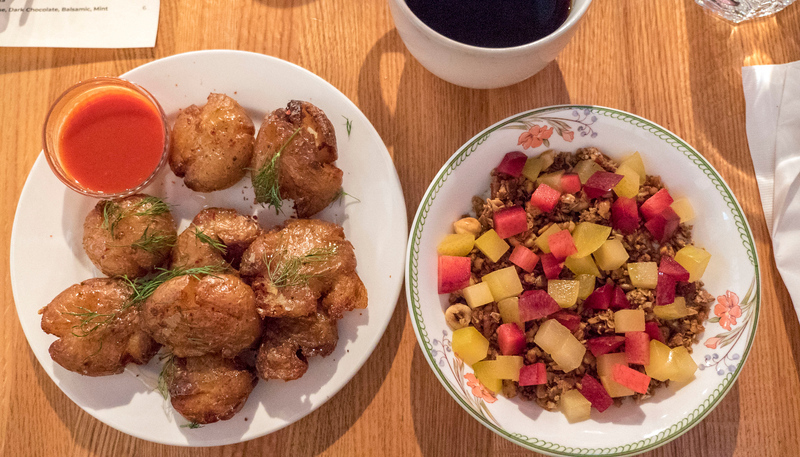 Start the day off right by savouring a delicious breakfast at Clementine. 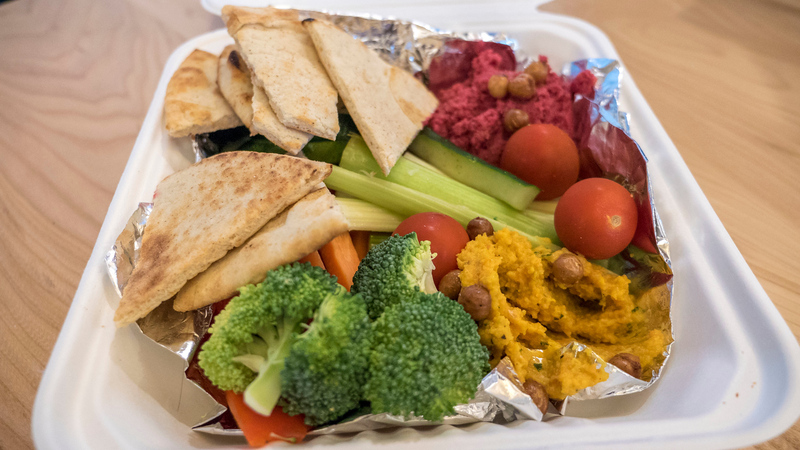 While it might not appear that there are many vegan options on the menu, Clementine is very vegan-friendly and willing to adapt several dishes. Our server was very knowledgeable of a vegan diet and shared every possibility for us to eat. Justin ordered the porridge, which was already vegan. The porridge consisted of mixed grains, coconut, pineapple butter, berries, and cashews. I ordered two sides: the baby red potatoes, and the cashew and banana chia seed pudding with peaches, plums, and granola. 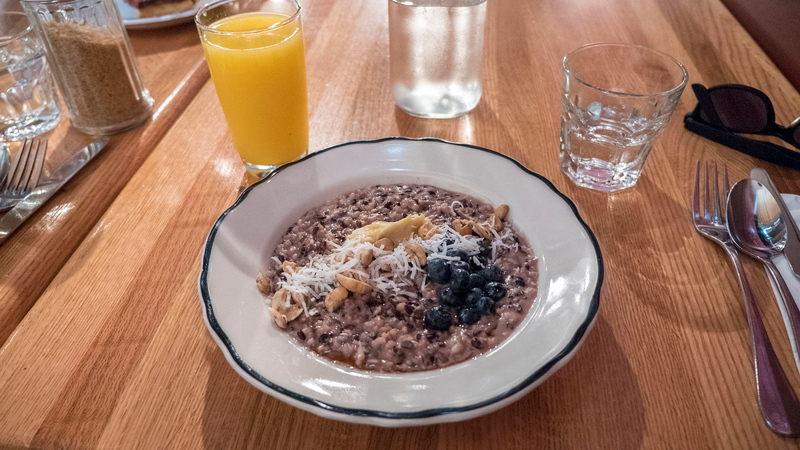 If you’re looking for a healthy way to start the day, be sure to stop by Clementine in Winnipeg. You could easily spend all day at The Forks. We had a limited amount of time, but managed to wander around The Forks Market and take a tour with Splash Dash. 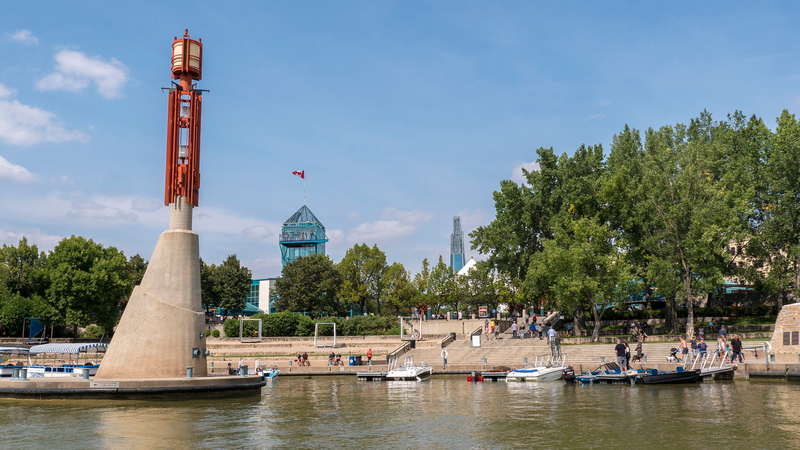 Next time, we’d love to spend an afternoon at the Canadian Museum for Human Rights, take a stroll along the Riverwalk, and climb to the top of the Forks Market Tower. You’ll also find the Travel Manitoba Visitors Centre here. 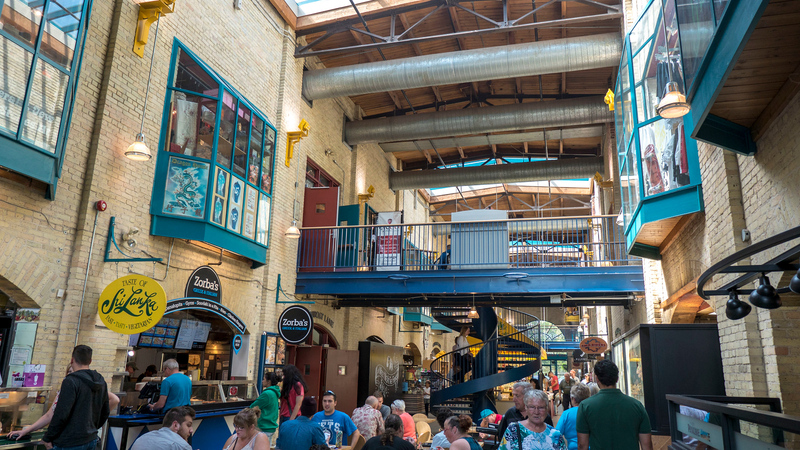 The Forks Market building was originally two stables of competing rail companies from early 1900. Now, a courtyard bridges the two buildings together creating a modern day marketplace. There are tons of specialty shops for souvenirs, crafts, and unique food items. You’ll find works created by 300 Canadian and local craftspeople and artisans. 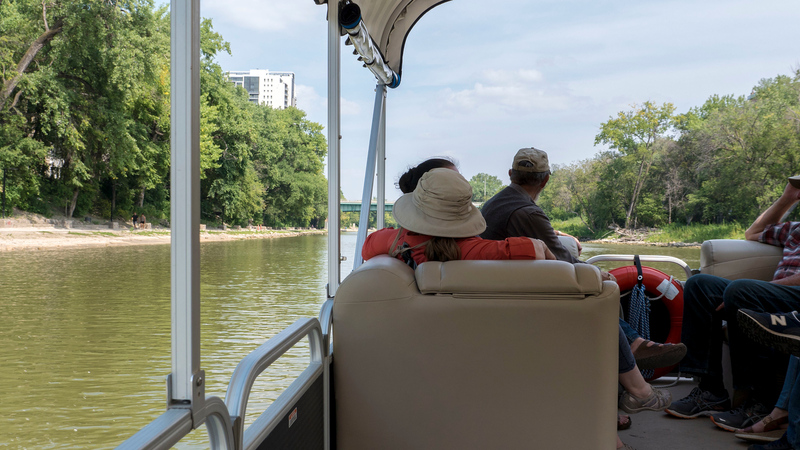 Splash Dash offers boat tours along the river with informative and entertaining commentary about Winnipeg. It’s a half hour guided boat ride where you’ll learn some history about the region and view specific points of interest on the way. The boat picks up speed at several points as you glide across the water. It’s the perfect activity on a bright and sunny day. I loved feeling the wind in my hair and a gentle breeze off the water. It was wonderful to pick up a few insightful facts about Winnipeg, especially as tourists to the area. On our boat ride, there were guests from Vancouver, the USA, and even Chile! 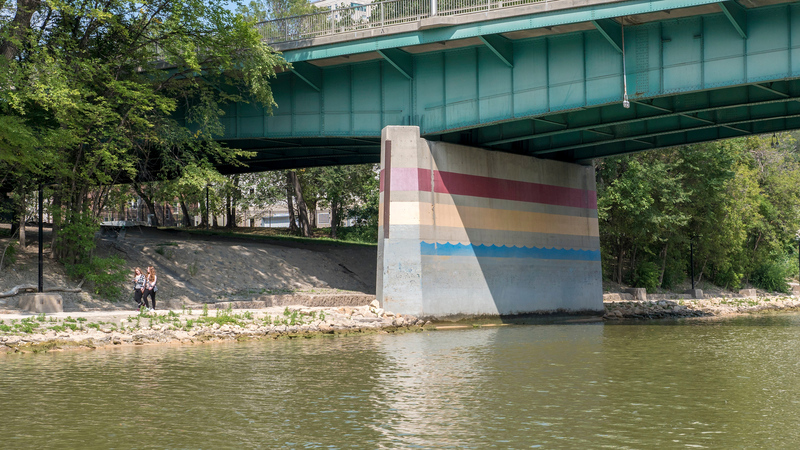 The painted lines beneath the bridge mark various levels of flooding in Winnipeg. If the water levels reach the red line, the city needs to be evacuated. Flooding in Winnipeg and the Red River Valley of Manitoba remains a devastating part of their history. If you’re interested in reading more, please check out this retrospective piece by CBC. With a dash of history and a healthy dose of beautiful city views, we thoroughly enjoyed this boat tour by Splash Dash. It’s definitely one of the best things to do in Winnipeg and a trip you must take when you stop by The Forks. 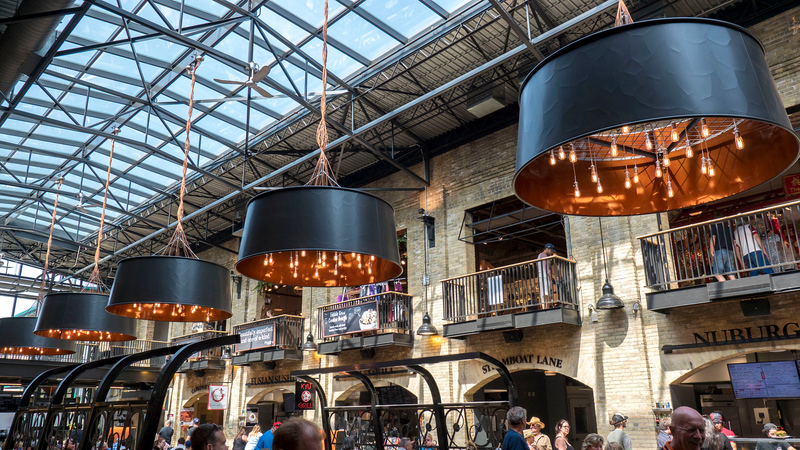 Don’t skip the opportunity to dine at The Forks! 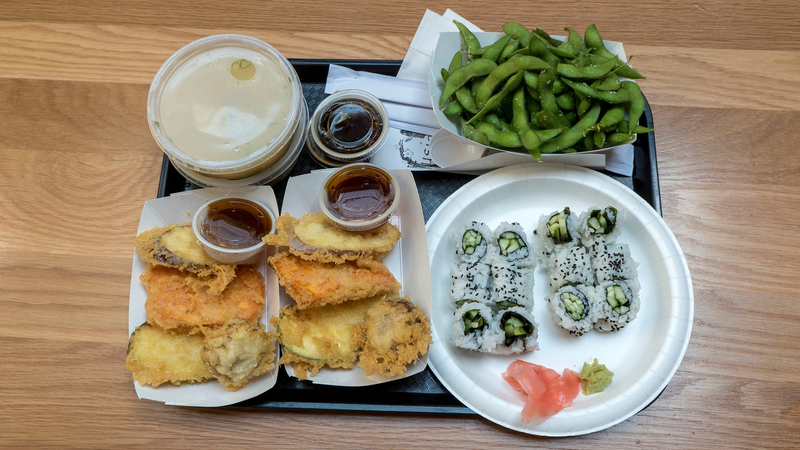 We stopped by the Fusian booth for a variety of Japanese food. They had lots of vegan options, including cucumber rolls, avocado rolls, vegetable tempura, edamame, and miso soup. We ordered a little bit of everything. 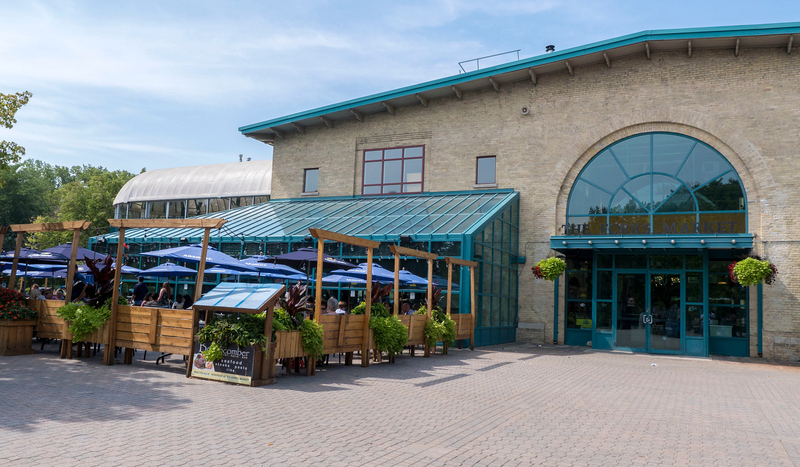 Check out this vegan guide to The Forks for a full listing of vegan and vegetarian options. Now that we’d sailed on the water and walked by the water, it was time to soak in the water at Thermea. Thermea is a traditional Nordic spa where you can fully indulge in a wellness experience. 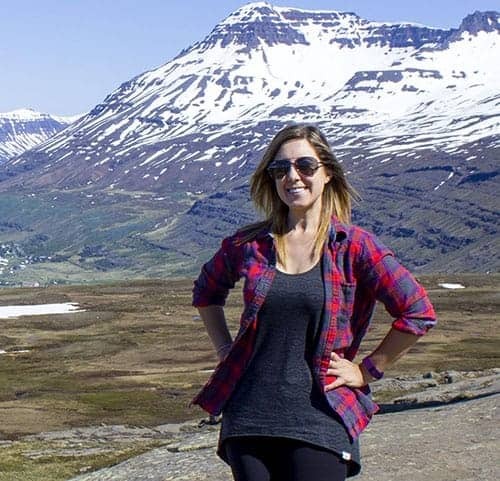 This ancient Scandinavian ritual provides numerous health benefits, including eliminating toxins, stimulating circulation, and providing an overall sense of well being. Move through the thermal cycle from hot to cold to relaxation to benefit completely. 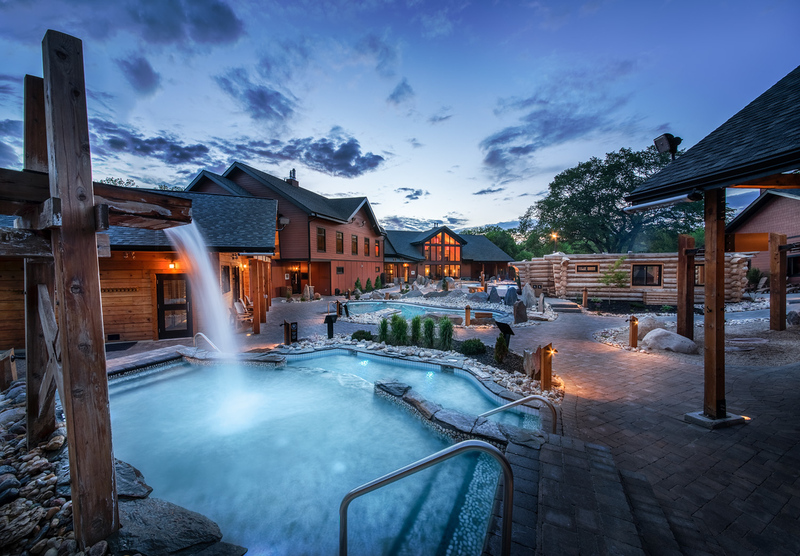 For instance, there are hot pools, saunas, and steam rooms for the hot portion. Then, move to a cold pool or take the plunge beneath a cold waterfall. Lastly, relax in Muskoka chairs by a soothing outdoor fireplace. Repeat this cycle three or four times at your own pace. The outdoor pools are in a scenic and peaceful setting, and guests are encouraged only to speak in hushed tones. Leave your cell phones and electronics in the change room or at home. It’s a time to leave your stresses and cares behind. Allow yourself to relax, rest, and rejuvenate. When Justin and I were resting in the sauna, we witnessed the ceremony that happens once an hour. One of the employees strikes a gong outside (which we only heard an hour later, while we were dining). Then, he walks into the sauna with new aromatherapy scents. He announced that the sauna would smell like fresh eucalyptus, and he threw these circular balls infused with essential oil onto the rocks. Next, he flung a towel in the air, ensuring that the scent (and the heat) flowed throughout the sauna. It was quite the ritual, and something you need to see in person! After a few rotations through hot, cold, and relaxation, Justin and I moved to the restaurant for a meal. Everyone receives a fluffy robe to borrow during their time at Thermea, which you can also wear right to the restaurant. We dined outdoors with our robes on top of our bathing suits for a very comfortable experience. 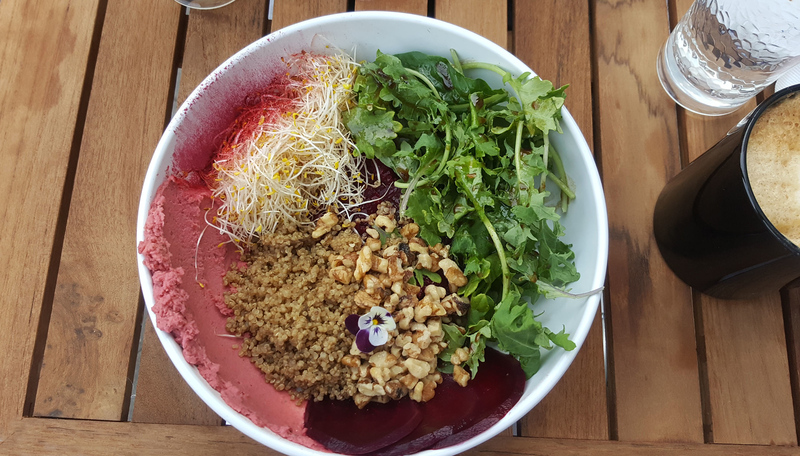 Thermea has one vegan option on their menu: a healthy bowl with quinoa, mushrooms, beets, beet hummus, arugula, and walnuts. We were grateful for such a tasty vegan, flavourful, and thoughtful meal. 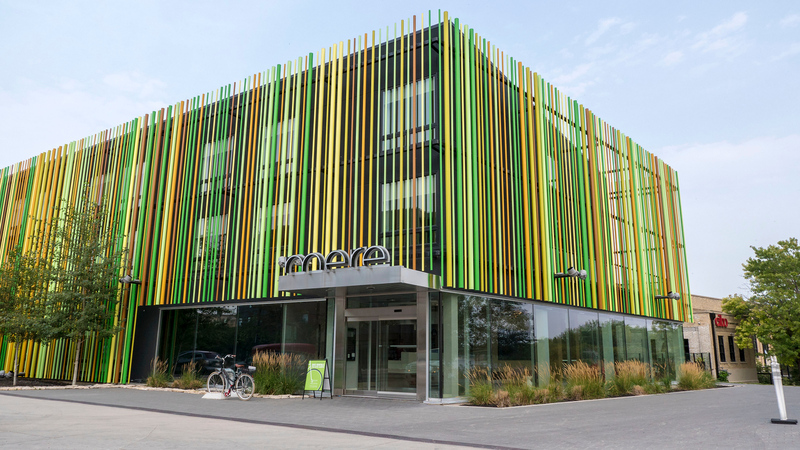 Thermea grows many fresh ingredients right on site. I also enjoyed a soy latte, which was warm and comforting. Justin and I enjoyed two restful nights at the Mere Boutique Hotel on the waterfront. 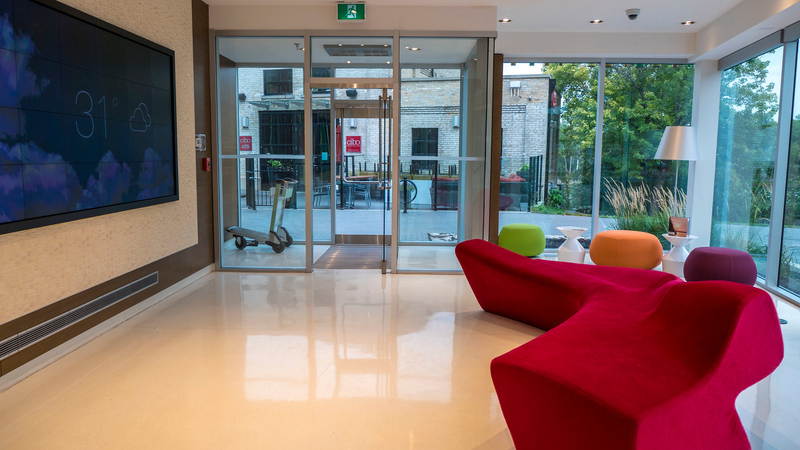 This stylish and sleek hotel has many complimentary amenities in the room, including juices and Clif energy bars. 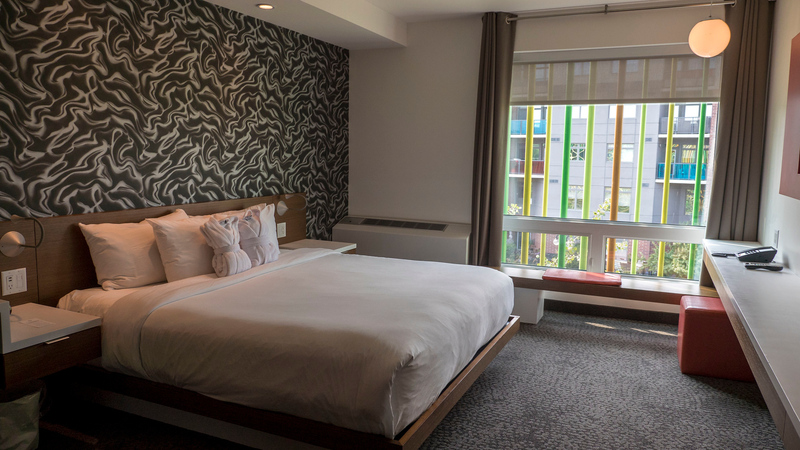 It’s a modern hotel with everything you need for a comfortable stay, including USB ports by the bed and ample outlets for working. The Nespresso coffee machine in the room brews the perfect cup, anytime of day. 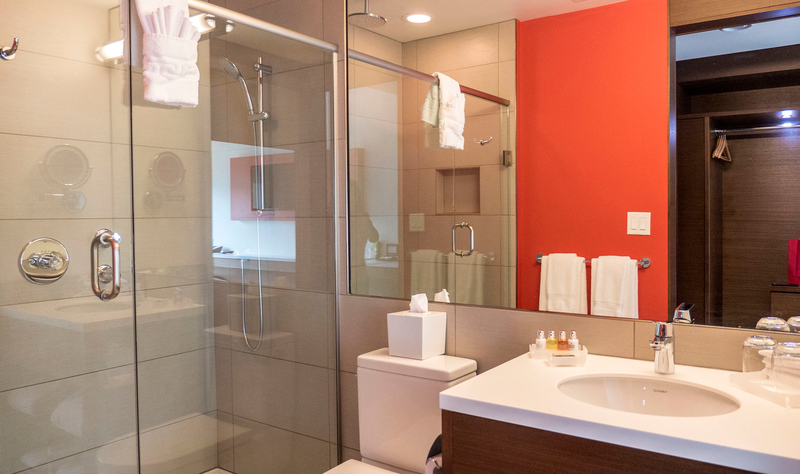 The bathroom is spacious with lots of counter space and shelves for our toiletries. We both loved the walk in shower with two shower heads, especially the rainfall one from above. 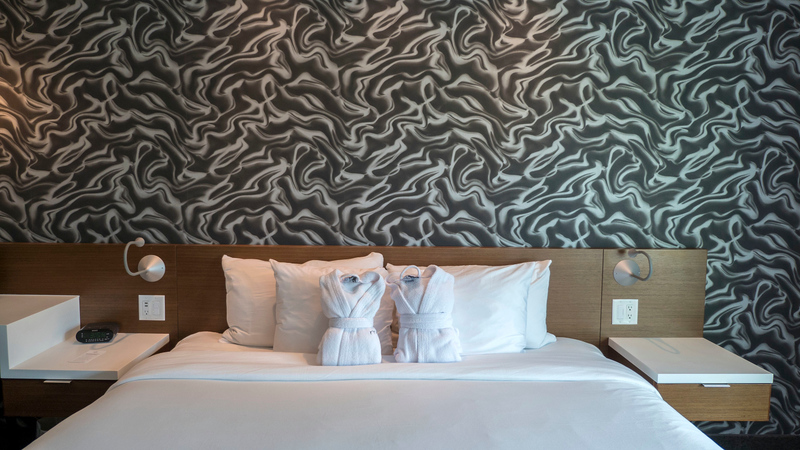 While the Mere Hotel doesn’t have tons of bells and whistles, it’s a premium hotel that provides the essentials and beyond. The design of the hotel is welcoming and memorable. 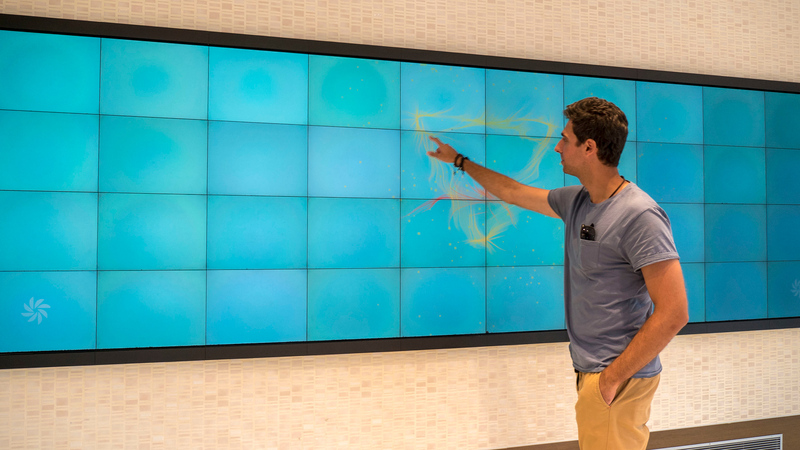 In the lobby, there’s an interactive wall that allows you to create art, and provides essential information like the weather. There’s a contemporary red sofa as a striking meeting place. Plus, we really loved the refreshing cucumber mint water in the lobby after returning from our adventures around town. Outside, you’ll be able to recognize the Mere Hotel from afar with its spectacular design. I noticed it right away on our Splash Dash boat tour when we viewed it from the opposite side from the river. Pop by the Cibo restaurant and bar next door for dining and drinks. Click here to check out more reviews of the Mere Boutique Hotel by fellow travellers. 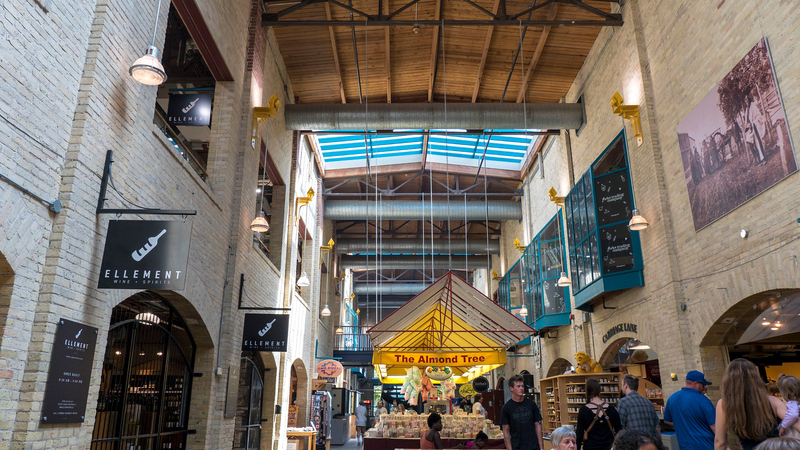 Click here to check out our entire travel photo album of Winnipeg! From our photography site, you can also purchase prints, beautiful canvas prints, housewares, and more – all made from our pictures. 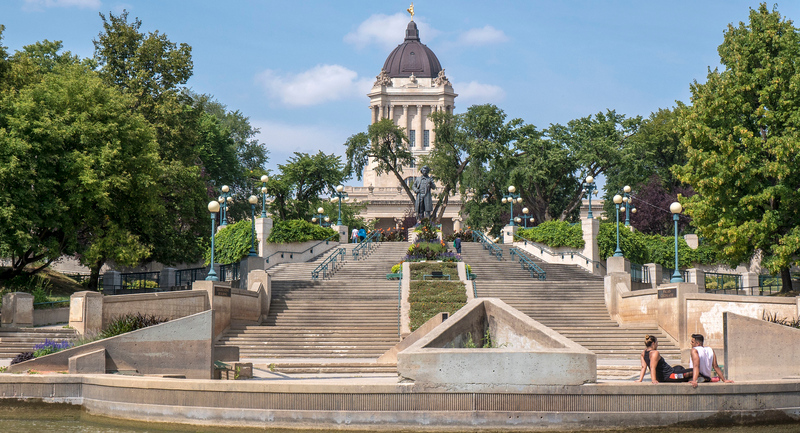 If you’re looking for things to do in Winnipeg as a couple or thinking about spending a weekend there, we hope that we’ve inspired your future travels. Winnipeg is only a short flight from many locations throughout Canada and the USA. It only takes a little over two hours to fly from Toronto to Winnipeg, making it the perfect weekend getaway. With only 48 hours in Winnipeg, we experienced many interesting places, tours and events; however, we only skimmed the surface of what Winnipeg has to offer. Justin and I are hoping to return to Winnipeg and Manitoba soon as we’d love to see more of this beautiful Canadian province. Have you ever travelled to Winnipeg? What are some of your favourite spots?